Replacing your stock speakers with aftermarket, high performance car audio speakers is the #1 way to get better sound from a car stereo. Many people believe that the easiest way to get better sound is to change out the head unit. While this will generally improve the features available versus the stock stereo (depending on what kind of vehicle and radio being used), the sound quality doesn’t usually improve. An aftermarket head unit has roughly the same power output capability that a stock radio does. Additionally, chances are the factory speakers are tuned to the stock radio; so changing out just the radio may result in worse sounding music. The easiest way to get better sound from a car stereo is to replace the speakers, and if possible, connect them to an amplifier. Car manufacturers don’t invest much into the stock audio system. Generally, the speakers have paper cones, small magnets, and are of a lower quality. Remember, car manufacturers want to sell cars, not stereos, so they give just enough to have an audio system. After all who, wants to drive a car without a stereo? Aftermarket speakers are designed with much higher quality materials and with a focus on sound quality. Performing an internet search for car speakers can be a daunting task as there are literally thousands of speakers in the market today of various sizes, constructed using a variety of materials, and with a multitude of engineering and marketing features. 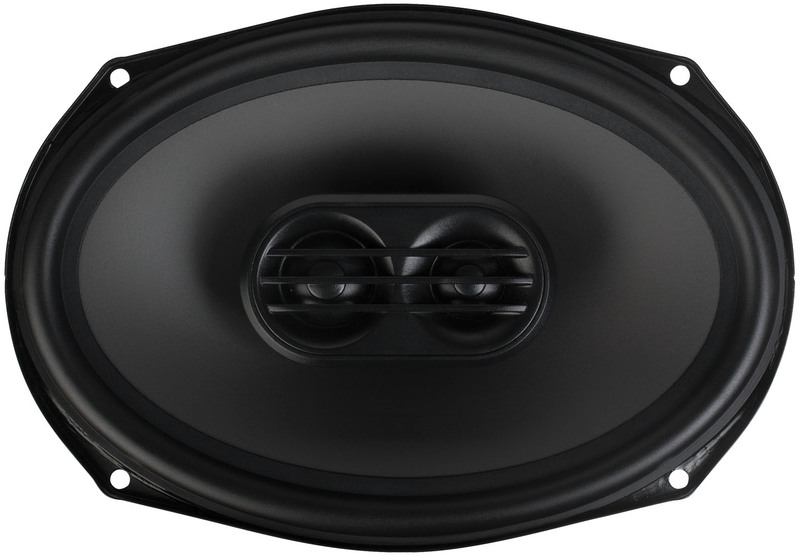 For the purpose of this article, the type of speaker will be the focus as that choice can make a significant impact on the sound quality of the system: coaxial, component, or mid-bass and bullet tweeters. 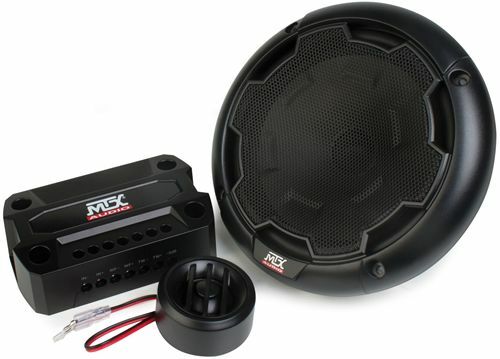 A coaxial speaker is the most common type of car speaker and is usually the least expensive to purchase. A coaxial speaker has two drivers, a woofer and a tweeter, mounted in the same basket. 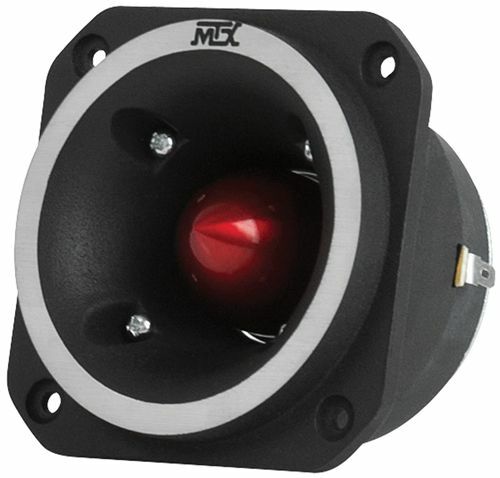 The tweeter can be mounted to a pole piece in the center of the woofer or on a bridge that spans two sides of the woofer. Coaxial speakers are designed to play a wide frequency range, generally between 50Hz and 20kHz. The woofer part of the coaxial plays the lowest frequencies in your music, 50Hz – 5kHz for example and the tweeter plays the higher frequencies, 5kHz – 20kHz. An internal crossover, often an inline capacitor, is what directs the proper frequencies to each driver. The speaker has a single terminal on the basket for connecting the speaker to the head unit or an external amplifier. Coaxial speakers are available in the most size options, anywhere from 3.5" to 7" x 10", and therefore are easy to find as direct replacements for factory speakers that don’t require any cutting or modifications when installing. Some vehicles today come with speakers that are separate with a woofer that mounts in the door panel and a tweeter that mounts higher up the door or in the A-pillar of the vehicle. These speakers are called component or separate speakers. The main difference between a component speaker and a coaxial speaker, besides the fact that the two drivers are "separate," is the inclusion of an external crossover. This external crossover has positions for both drivers to connect independently and then the crossover connects to the head unit or amplifier. This gives the user greater control over how the speaker will sound. Additionally, since the drivers are separated with the tweeter being closer to the listener's ear, the sound staging is greatly improved over a coaxial speaker that has both drivers in the same location in the door panel. Component speakers often use higher end materials like Kevlar or glass fiber on the woofers and Teteron® or titanium on the tweeters making them a more expensive option than a coaxial. Before buying a speaker replacement it is important to understand the type of stock speaker being replaced to ensure that the right style is purchased to replace it. For a more custom looking and sound system, mid-bass drivers and bullet tweeters can be used to really make a statement. While coaxial speakers and component speakers can be connected to a head unit without an amplifier (although using an amplifier is highly recommended), mid-bass drivers and bullet tweeters require amplification in order to function properly and maximize their performance. These types of speakers are designed to handle significantly more power than their coaxial and component speaker cousins. Mid-bass drivers are available in multiple sizes, usually 6.5" to 12" and play exactly what they say, mid-bass frequencies (60Hz – 5kHz for example). Bullet tweeters follow the same model. They are bigger than the tweeters found on coaxial and component speakers (up to 4"), and they handle much more power as well which allows them to produce extreme volume levels especially when properly amplified. The best part of using these types of speakers is that each speaker can have its own channel of amplification allowing the user to really dial in the crossover of the amplifier to make each speaker perform to its maximum potential. Using these speakers requires a much greater monetary investment since more speakers are required to reproduce all frequencies and an external amplifier is required. There are still some other things to consider. Some new cars have integrated sound processing in their radios that enable the manufacturer to put a lower quality speaker into the vehicle that they then digitally manipulate the signal path to in order to make it sound passable. Replacing speakers in a vehicle like this can cause the sound quality to decrease because the new speakers are not equalized for the output of the radio. Instances like this will require the addition of equipment to recalibrate the signal path to flat so the new speakers will function properly or the replacement of the head unit all together. Secondly, while not necessary, adding an amplifier to a system will increase the volume output and clarity of the music in a system with upgraded speakers. Aftermarket speakers are designed for use with amplifiers in order to get the best possible sound quality. Finally, like with other car audio products, pay attention to the specifications. When you are comparing speakers, especially power handling, make sure to use RMS power handling instead of peak or max power handling to get a true accurate rating of how the speaker will perform. Frequency response is also an important specification that will show how much bass a speaker can play. Bass frequencies are in the range of 20Hz – 200Hz. A speaker that can play closer to the 20Hz frequency will deliver more bass, which is important especially if a subwoofer is not going to be added to the system. It can be confusing, but understanding what type of speaker is getting replaced, what speaker options are available, and what to look for when choosing a speaker can make selecting your new aftermarket speakers a much easier process that will greatly increase the performance of any car stereo system.